In my life I have prepared nachos only once ( Nachos de Camarones) and my family asked me to make some more. This special wish came perfect with the given list of ingredients I for the game “ready set cook” as tortilla and chicken were among the options. The combination were done quite quickly and the result delicious. I did not add cheese (as not in the list J ), and exactly had been appreciated as the dish resulted lighter; I think I would have added some cumin, but all spice was a great alternative and finally the addition of the thick yogurt made the dish fresher! I recommend not adding too much salt, as the chips are usually salted; adapt the quantity to the chips! Fry gently the garlic with the butter in a medium saucepot until fragrant add chicken and gently roast stirring from time to time for about 5 minutes. Add chicken broth and tomato sauce. Let simmer for about 30 minutes or until the chicken turns tender. In the meantime, arrange the chips on four oven save dishes and place them at 80°C/180°C to preheat them in the oven. When the chicken is done and sauce thicker add cream, hot sauce, spices, cilantro and adjust with salt and pepper. Remove the plate from the oven; pour the chicken sauce over the tortilla chips, dot with yogurt and top with fresh herbs. Serve immediately with extra yogurt if desired. A Peruvian recipe for Cilantro lovers as cilantro is the principal source of flavor of this specialty! 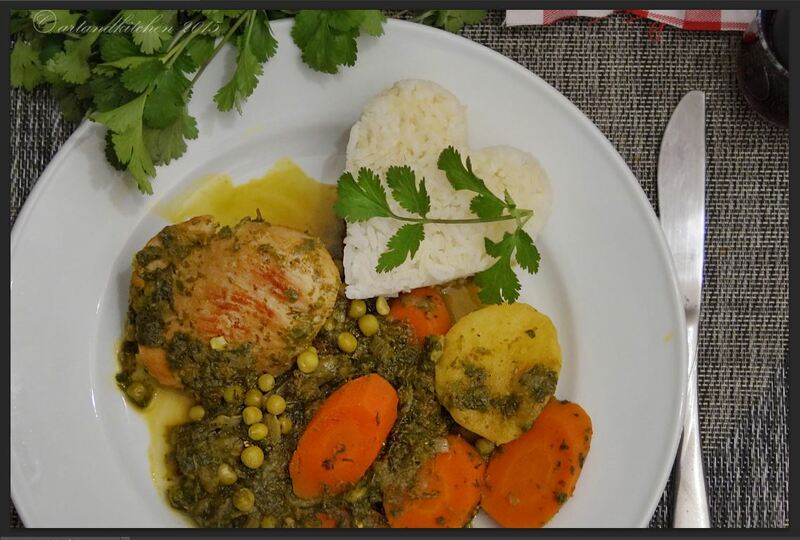 “Seco” is another very popular recipe of Peruvian cuisine and has the Arab influences brought by the Spaniards. Seco can be made with beef, goat, chicken other kind of meat. I made it with chicken but if you prepare it with beef or goat you should cook it about 2-3 hours until the meat is tender. We enjoyed this recipe in Arequipa in a very simple restaurant where we got a huge well smelling and filling portion. Today this dish is so beloved that you can find it almost overall in Peru. Today I had lot of fresh cilantro from a Turkish shop, the perfect occasion to prepare this dish! I prepared some ají amarillo paste myself for this recipe and I canned some portions for the next recipes. As many other dishes all over Peru this is served with rice even if you have a carb ingredients in the stew itself: the potatoes! Place spinach and cilantro into a blender with the water, process and keep aside. Heat the skillet again with 2 tablespoons oil and fry onion, garlic and ají Amarillo until onion are translucent. Pour the blended cilantro mixture and return chicken to the skillet. Cook for about 10 minutes while you prepare the vegetables. Add potatoes, peas and carrots as well as the chicken broth. Season with salt, pepper and cumin to taste. Simmer over medium-low heat for about 30 minutes with the lid on. Check from time to time you need to add more water. If the sauce is too liquid uncover the skillet and cook for a few minutes or until the vegetables are tender. 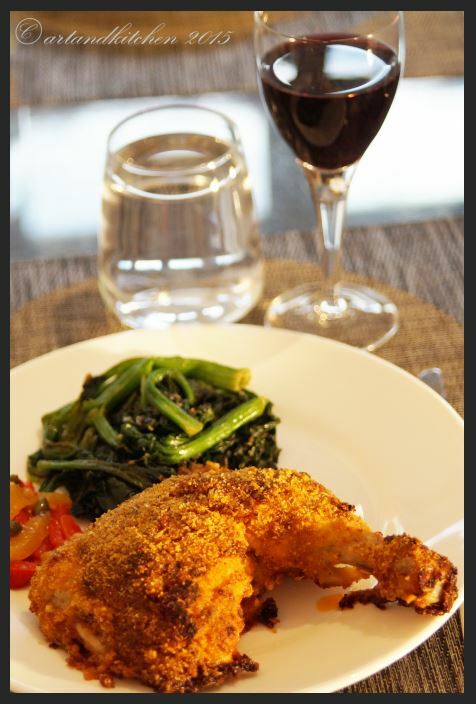 Crispy juicy skinless chicken? No problem, this recipe is for you and you will be surprised by the tenderness of the meat and the crispy delicious coat. The amount of dressing and coating is approximate what I needed. If you opt for a longer marinating time you may increase the dressing quantity. The choice of the ingredient is typically Italian; however we can find many Italian recipes using simply milk or beaten egg instead of dressing. For this recipe I used chicken legs but you can use skinless breasts instead. Toss well the chicken with the dressing to marinate for at least 20 minutes (you can marinate it for a few hours in the fridge as well). In a flat bowl mix all the ingredients for the coating (except the olive oil). Coat the chicken piece by piece with the crumbs mixture and place them in a baking foil. Drizzle with olive oil and if you like mix rest of dressing and crumbs and lightly press on the chicken. Bake for 30-35 minutes until browned and chicken done.